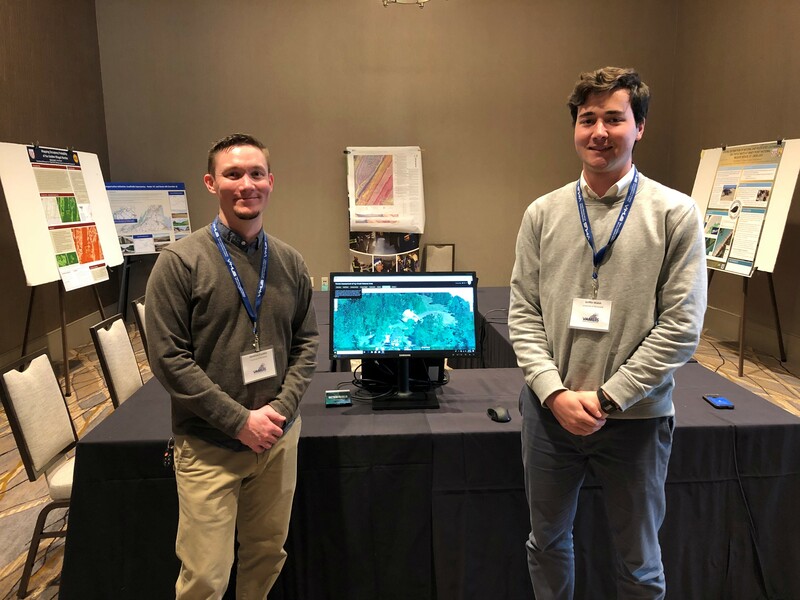 University of Richmond undergraduate students in the Department of Geography and the Environment, alongside SAL GIS Technicians and research assistants, created posters and web maps to communicate their research at the 2019 VAMLIS GeoConference. 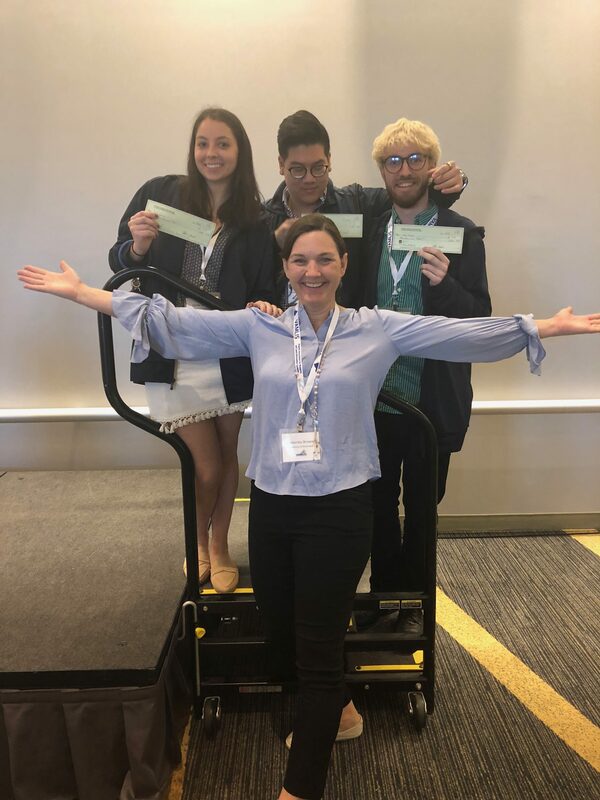 Students and SAL Interns Valerie Galati, Matthew Franklin, Griffin Walsh, and Emily Routman presented their research to GIS specialists throughout the state during the poster session, and several received awards for their work. 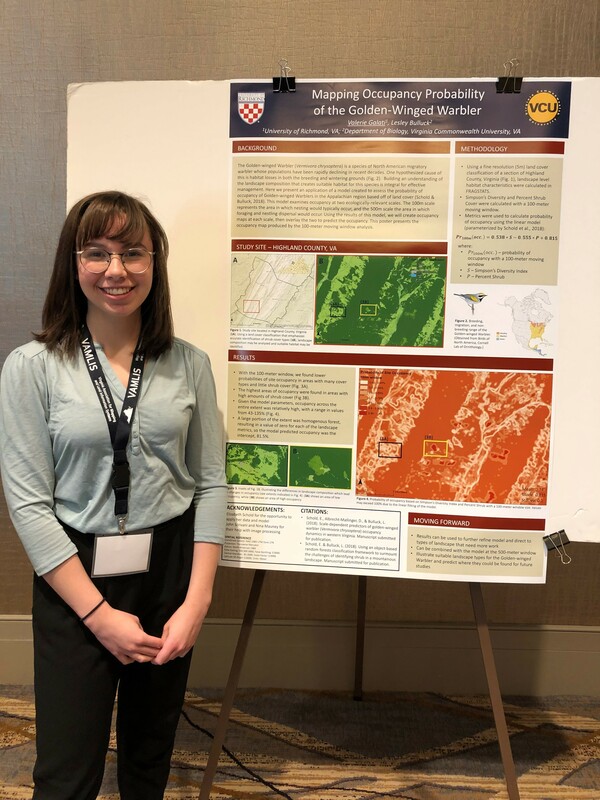 Valerie Galati, SAL Intern and Student (’19) — Mapping Occupancy Probability of the Golden-Winged Warbler. Matthew Franklin (’19) and Griffin Walsh (’20), Students and SAL Interns —A Comprehensive Overview of Topography and Vegetation at Ivy Creek Natural Area. Undergraduate 2nd Place Winner! 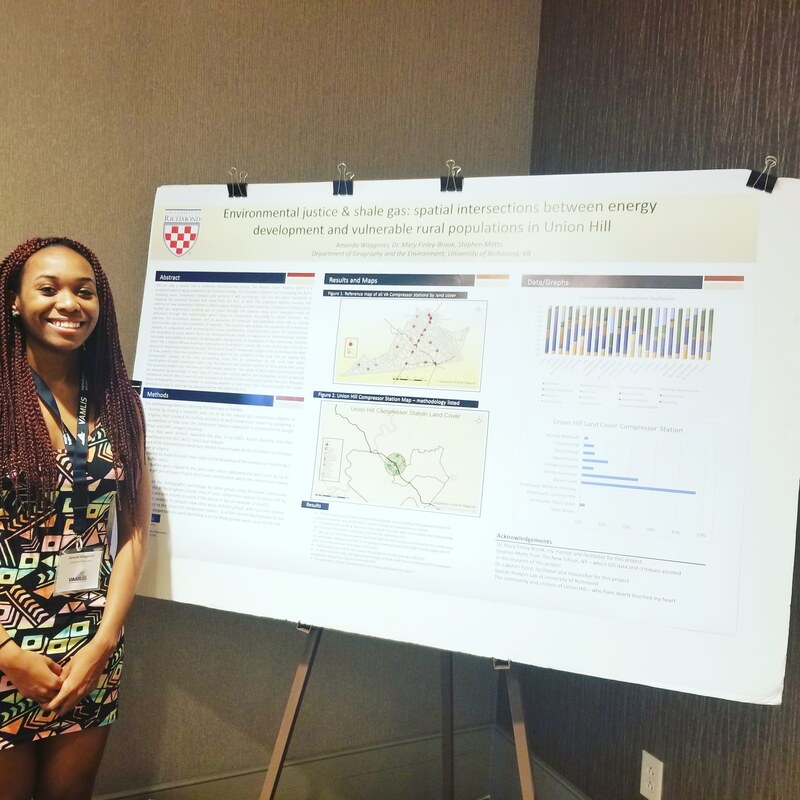 Emily Routman, SAL Intern and Student (’20) — Poverty and Health Outcomes in Dallas Texas. Undergraduate 3rd Place Winner! 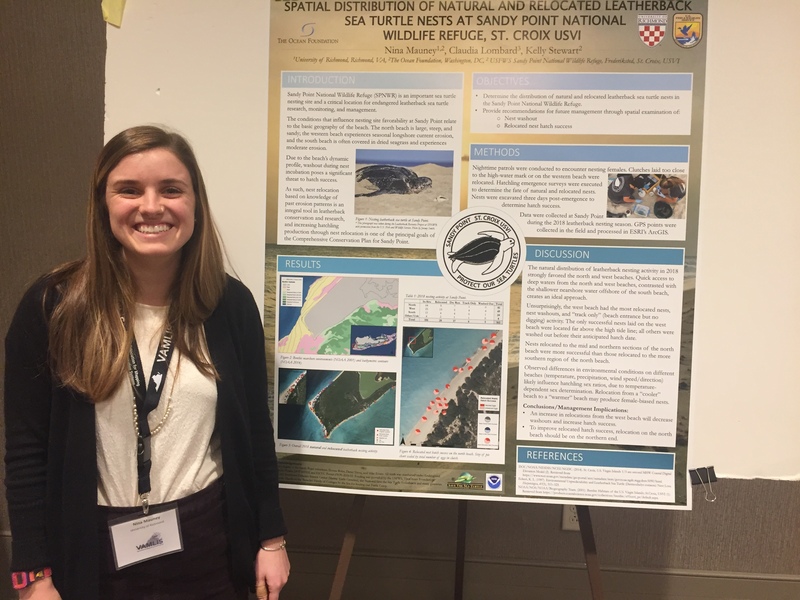 Nina Mauney, GIS Technician and Research Assistant — Spatial Distribution of Natural and Relocated Leatherback Sea Turtle Nests at Sandy Point National Wildlife Refuge, St. Croix USVI. Professional 3rd Place Winner! Amanda Waggoner, GIS Technician — Environmental Justice & Shale Gas: Spatial Interactions between Energy Development and Vulnerable Rural Populations in Union Hill. Graduate 2nd Place Winner! Congratulations to all GeoCon Poster Session participants! This entry was posted in Uncategorized on April 15, 2019 by Christina Mauney. A few weeks ago I was bit by a tick in Pennsylvania. After arriving in Kenya, I began to develop a rash on the exact spot where I had been bitten so I began to suspect Lyme disease. We decided I should go visit a doctor to confirm that I did not have the disease, which comes with a whole host of nasty side effects. I think its always essential to sample the local healthcare when travelling abroad. Dr Joireman and I decided to head to Nairobi Hospital to go meet with a doctor. After filling out the required paperwork we waited for about two hours to see a doctor. Finally, we were admitted and spoke to the doctor. Unfortunately, Lyme disease does not exist in East Africa so the doctor had never seen a case regarding the specific disease. He told us he had only read about it in textbooks. The doctor was very knowledgeable and friendly. He prescribed me some medication that worked both as an antibiotic and anti-malarial, which killed two birds with one stone. An interesting aspect about the visit was the doctor used his iphone as an examination light. After he had written the prescription we chatted for about ten minutes about our lives and how he had worked abroad in the United States. He lamented that he enjoyed the United States but the work environment was very sterile and impersonal. He much preferred the familial and personal relationship based system that exists in Kenya. We agreed that it was much better to have those personal connections, even if it meant waiting a bit longer in the waiting room. Another thing that surprised us about the hospital visit was how cheap it was compared to United States standards. The whole experience including prescribed medicine was less than thirty dollars, without insurance. This experience gave us an opportunity to see a part of the healthcare system in Kenya. The team arrives in Kenya! Yesterday we had our first day in the office at the National Land Commission. We received a very warm welcome when we arrived from the whole staff and spent some time getting to know our colleagues who we will be working with for the next month. They showed us our office spaces where we would be working. After these introductions we went to the conference room for a press conference. The various employees and commissioners at the National Land Commission introduced themselves to the media and to the people present. There were several reporters and TV cameras present at this meeting. Dr Joireman, Dr Boone, and Professor Browne all spoke about the project. The commissioner then gave a small speech and ceremoniously handed each collaborator on the project a set of the Kenyan constitution and a book on Kenya land policy. After this meeting we went to the Fairview Hotel for lunch and spent some more time getting to know our colleagues. We were also finally able to look at the Kenyan settlement schemes on the hard drive we were given. There are over a thousand files so it will take some time to go through them but we are excited to finally start working on the project using the maps. Our colleagues at the National Land Commission have been very gracious in providing us excellent spaces to work and we feel very welcome in Kenya. This entry was posted in Uncategorized and tagged kenya, nairobi, student post, summer research on June 18, 2018 by Taylor Holden. We’re in the midst of prepping for our trip to Kenya! This week we’ve been holed up in the SAL glued to our desktops while we’ve practiced Swahili, read about African culture, and reviewed/practiced different GIS tools. Our week has included conversations about office etiquette and we have even researched alternatives to plastic bags due to Kenya’s ban on them. We’ve talked through some of the obstacles we might face and some of the cultural differences that we will come across. It’s been helpful to learn about some of the beliefs that are valued in African culture, such as status, respect, and relationships. Although many cultures have similar beliefs, it’s fascinating to see that cultures have different priorities. For example, in many African countries, relationships are much more important than some American values such as doing business as quickly as possible without a focus on the actual people doing business. The majority of our time has been spent focusing on the work we’ll be doing in Kenya. This has included writing up workflow drafts and gathering and preparing the data files that we’ll take with us. First we catalog the maps, then georeference, digitize, edgematch/combine polygons, add attributes, and then wrap up with metadata. That’s practically nothing, right?! And only for 1,340 maps give or take! Easy! Honestly, it’s all a bit daunting and we still feel a little uncertain about how a lot of this will happen. In short, we aren’t sure what to expect. Nonetheless, we’re very excited for this project and eager to meet our colleagues. Everything requires an overwhelming level of organization and every step is very detail focused. We’ve run into some amusing obstacles along the way; I think keeping a good sense of humor is of the utmost importance! For example, while cataloging a settlement scheme map, it appeared to have the numbers “5810” on it. Later on, while georeferencing the map, we could not find where it was supposed to be placed. The 5810 made absolutely no sense because the grids aren’t organized into blocks that go up to 5810. Through trial and error we found out that the 8 was an ampersand! Kim pounded her fists on the floor. It was quite the day! We’re excited to head to Kenya soon and I think that we will face many obstacles in the office, but as long as we keep a good sense of humor we’ll be all set. I’m pretty sure the saying “patience is a virtue” will be my mantra. This entry was posted in Uncategorized on June 11, 2018 by Taylor Holden. 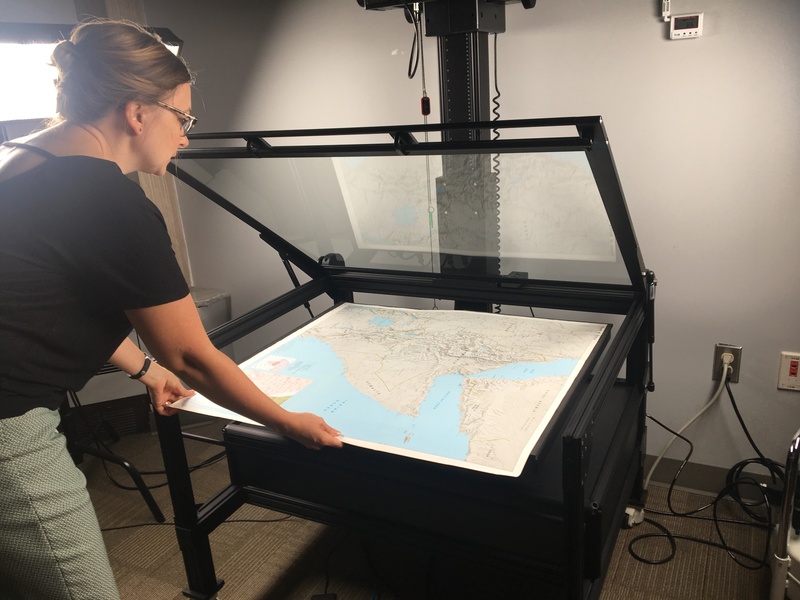 Today we met Kimberly Wolfe in the Digital Scholarship Lab in the library to learn how to convert physical maps to a digital form. We used the university’s high-tech, super-expensive camera and a program Kimberly called “photoshop on steroids” to take a photo of the map and adjust the focus, exposure, white balance, and alignment. Our end result was a high resolution.jpg nearly identical to the physical map, and ready to be imported to ArcMap and georeferenced. The National Lands Commission has already scanned the maps of the settlements, so we will not be involved in that aspect, rather we will be cataloging, georeferencing, and digitizing the scanned maps. However, seeing how to scan maps and convert them to digital forms helps us understand the process from start to finish, rather than simply the components we will be working on directly. We been dividing our time between technical, GIS-related prep/training and ensuring we’re prepared with things such as medications, clothing, and TSA-approval, plastic-free travel bags. Yesterday Taylor showed some of the data he has been downloading from OpenStreetMap that will be useful to us when we are digitizing the polygons of the settlements. We created a template map documents including roads, waterways, and counties in Kenya, as well as a 50k and 10k grid. Each settlement map has an index number, which we will use to locate the settlement within our grid system. Once we have the location, we will be able to see the roads/waterways that constitute the settlement’s borders and use the corresponding features of those roads/waterways from the OpenStreetMap data to digitize a polygon of the settlement. We have also been reading books and articles about Kenyan culture and corporate etiquette and practicing some simple Swahili phrases, such as “habari” meaning “hello,” and “asante” meaning “thank you.” We are trying to read some of the most popular/important books in Kenya culture, and I am currently reading “Wrestling with the Devil,” Ngũgĩ wa Thiong’o’s memoir recounting the time he spent imprisoned by the Kenyatta regime. From 1977-1978, Ngũgĩ wa Thiong’o was detained in Kamiti Maximum Security Prison, under 24-hour surveillance. It is here in prison, however, that he writes his most famous novel, “Devil on a Cross,” on prison-issued toilet paper. While it is impossible to learn everything about a culture in just two weeks, it has been fun for us to immerse ourselves in Kenyan history, language, politics, and customs as we try to learn as much as we can in preparation for our trip. 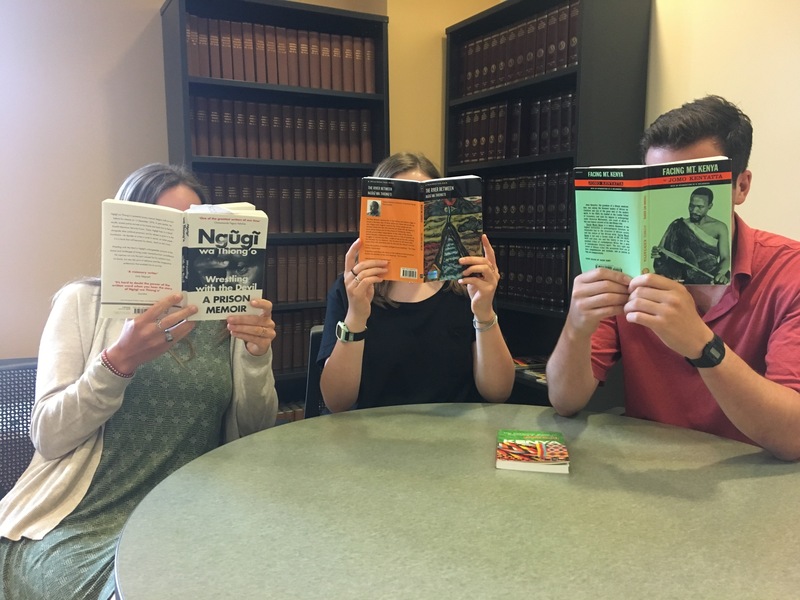 We are finishing up our training and some last-minute packing and are excited to be in Nairobi soon and start working at the NLC! 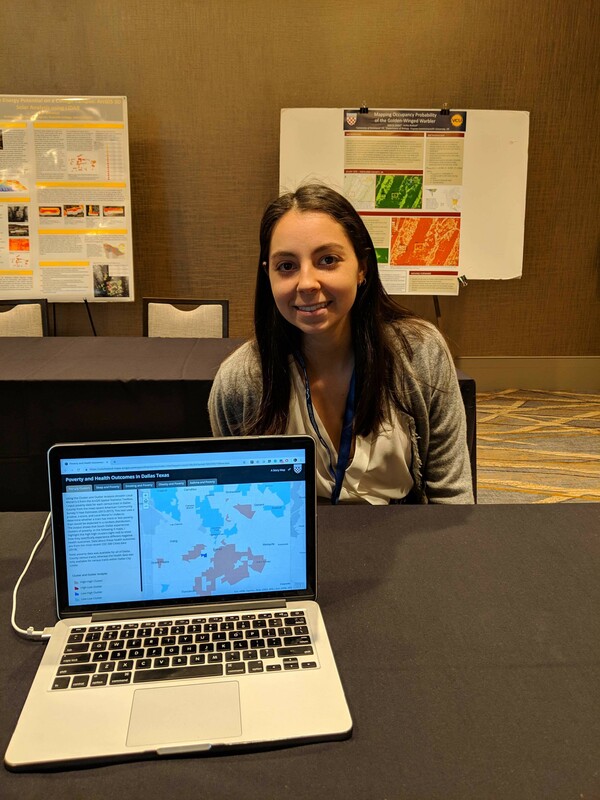 This entry was posted in Outreach, Student Experiences and tagged africa, digitizing, east africa, historic maps, kenya, kenya 2018, paper maps, summer research on June 7, 2018 by Taylor Holden. Summer 2018 in the SAL….and Kenya! The Spatial Analysis Lab has been a hub of activity since spring classes ended and we said goodbye to our graduates. Colleagues from Biology and Classics have been in and out of our space collaborating on the East End project, Rock Pools and more. Justin Madron from the Digital Scholarship Lab taught a short Story Maps workshop and Nadia Hatchel provided training on Survey 1, 2, 3. We are grateful for all of their talent. Soon we will say bon voyage to our GIS Technician, Taylor Holden. Taylor’s dedication to our mission will be missed. Thankfully, we’ve hired a new technician who will begin later this summer. More on that later. 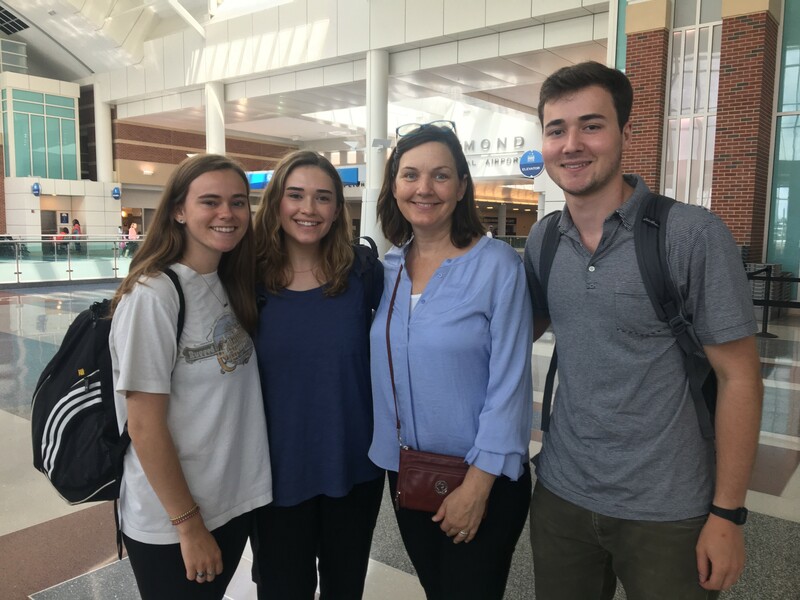 For the last few weeks I’ve been working with three undergraduate students to prepare them for a month-long stay in Nairobi, Kenya. The students have each been awarded summer research funds through the University and travel funds through the Office of International Education. Our work is part of a larger project with Dr. Sandra Joireman, the London School of Economics and the Kenyan National Lands Commission. The bulk of our work involves helping to inventory, georeference and digitize a set of historic Settlement Scheme maps for the National Lands Commission. 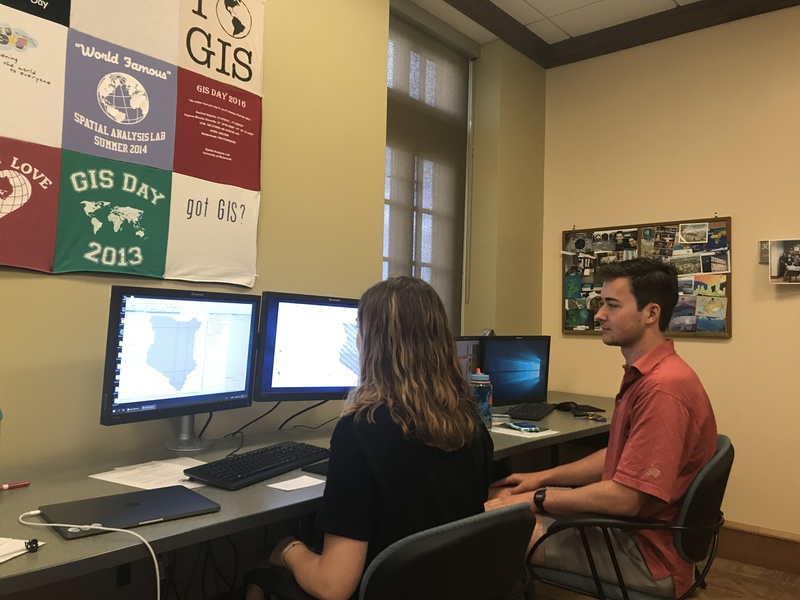 The three student researchers completed our Introduction to Geographic Information Systems (now Foundations of Geospatial Analysis) this past spring. The work in Kenya is an incredible opportunity for the students to synthesize course concepts, learn new techniques, and contribute to the research of our collaborators in substantive ways. It has been rewarding to think about all of the different technical pieces required to make this project happen. Hearing my students say things like, “oh, I remember doing that in class” is one thing. Watching them pull together a workflow and technical document for this project is yet another. It’s incredible! Besides the technical aspects of the work, there are other challenges (cultural, time, being Mzungu). During one of our recent mornings we spend almost 3 hours trying to understand some of the collar information on a map … only to find that what we thought was an “8” was an “&”. What a great lesson as we start this journey! How many “&”s hidden as “8”s will we encounter along the way? Could it be we don’t know nearly as much as we think we know? Can we open up enough to admit our ignorance? Are we, the experts, ready to learn? This entry was posted in from the director's desk on June 5, 2018 by Taylor Holden. 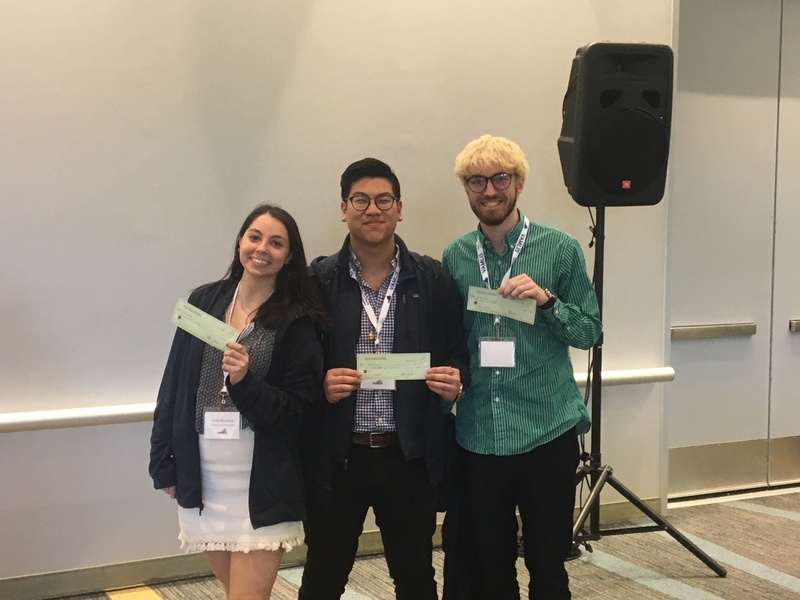 University of Richmond students from the Advanced Spatial Analysis course took home 1st, 2nd, and 3rd place in the Undergraduate Web Map competition at the 2018 VAMLIS Virginia GIS Conference in Virginia Beach. Congratulations to these amazing students!!! Check out their web maps below! Immigrants account for around 17% of Dallas’ population, and they have a big impact on local businesses, jobs, and more. I am going to analyze–by census tract–which immigrant populations (by country of origin) are more likely to cluster together, and which are less likely to. I used American Community Survey (ACS) 2016 data from the US Bureau of the Census and United States Geological Survey National Land Cover Database (NLCD) to create a weighted index model on the vulnerability of populations within the City of Richmond. This vulnerability index is my contribution to the Urban Heat Island Project collaboration with the Science Museum of Virginia. The vulnerability factors from the ACS data were: poverty rates, racial demographics, age demographics, education levels, and unemployment rates. Land cover data specifically aimed towards identifying land cover classes in the areas of the vulnerable populations will also be analyzed. The main objective of this project is to identify locations showing the most vulnerable areas within the City of Richmond so they can be compared with areas of extreme temperature. GfK MRI is a survey and analytics company that completes an annual Survey of the American Consumer. Part of this survey includes MLB game attendance and an MLB “Super Fan” Poster/WebMap App Abstracts from the 2018 VA GeoCon 9 | Page designation. Using this data (provided by ArcGIS Business Analyst) at the county (maybe hex bins) level, I will analyze “fan-ship” intensity in relation to proximity to nearest MLB ballpark. This entry was posted in Online Mapping, SAL, Student Experiences on April 6, 2018 by Taylor Holden. Want to check out many of the cool maps, applications, and story maps students, faculty, and staff have created with help from the Spatial Analysis Lab? This entry was posted in Uncategorized on December 13, 2017 by Taylor Holden. OpenStreetMap (OSM) is a collaborative map of the world where users can edit and update maps of their communities in real time. It was inspired by the success of Wikipedia and has quickly spread to become a force in online mapping world. While local governments in the US and other western countries are rapidly deploying “Open Data” platforms, there is still great unevenness in the quality, scale, and availability of worldwide data, especially data in previously colonized/developing countries. OSM provides a platform for citizens to contribute to the availability to data anywhere on the globe and often fills in gaps in data availability quicker than governments or nonprofits can. This is evidenced by OSM’s “mapathons” held after natural disasters, where individuals from universities, corporations, and non-profits collaborate to update road, building, and other key infrastructure data using satellite imagery so relief workers can utilize the best data in their response efforts. When we have faced challenges in acquiring data for a particular area or region through traditional methods, we often turn to OSM for a solution. OSM will often have more updated and complete roads/infrastructure data than other sources. These data are especially useful for cartographic endeavors where finding layers quickly for context is essential. However, OSM data is not as immediately available for download in ArcGIS friendly formats. Here I will show 2 methods of downloading OSM data for use in ArcMap. The first method is to download directly from the OpenStreetMap website using their exporter. Simply go to www.openstreetmap.org and find the area you would like to download data for. Hit the “Export” button and you will see a screen with the Extent of the download appear. You can customize this download as either the “current extent” or manually select an area by bounding box. Then hit “Export” and download the file as a .osm file. Now you need to convert this .osm file to a .shp file. You can use mygeodata.cloud for free conversions (up to a certain file size) or look up another converter on the web. The output will be separate shapefiles for points, lines, and polygons. I recommend using the original OSM map to identify the feature categories you want to pull out. QGIS is an open source GIS platform. It is known as one of the best open source GIS options for those who do not have access to (or don’t want to pay for) ESRI software like ArcMap. QGIS has built in functionality to download data directly from OSM and convert it into shapefile format. You can follow these directions: http://learnosm.org/en/osm-data/osm-in-qgis/. This entry was posted in Uncategorized and tagged data download, how to, osm on October 30, 2017 by Taylor Holden. 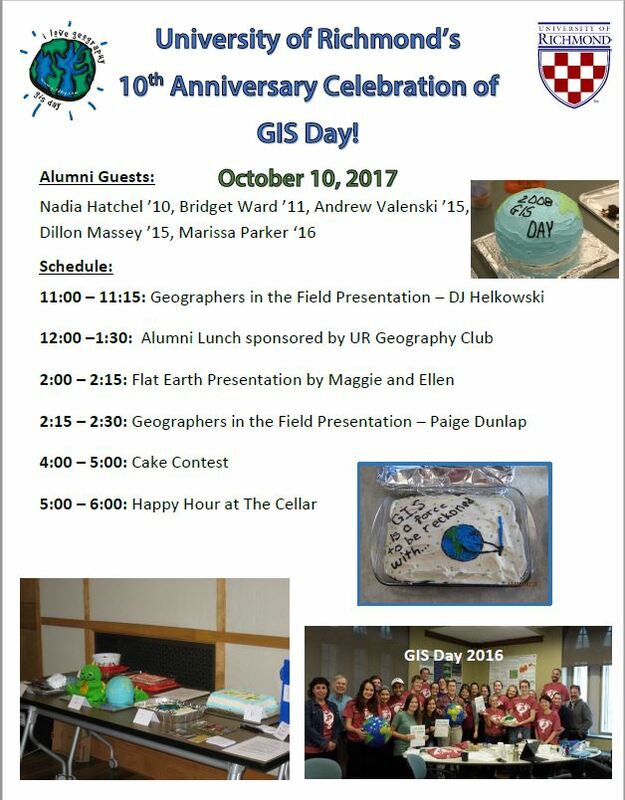 This year we are celebrating our 10th year of GIS Day at the University of Richmond! We have alumni returning and our famous cake contest will be lit! This entry was posted in Uncategorized on October 9, 2017 by Taylor Holden. After an exciting summer on the river and in the lab with our high school MSI students, it is time for the school year to start yet again! This year we will be clustering project work days and walk in hours to increase productivity and foster collaboration among various users of geospatial technology across campus. Our student interns will be available for consultation as well as the SAL Director and the GIS Technician. If you have a GIS project/problem/inquiry stop by and see what we can do to help. Or fill out this form so we know you’re coming! This entry was posted in Uncategorized on August 25, 2017 by Taylor Holden.